This is Moon Day, which should be a national holiday. Forty years ago today, pushing our technology far beyond what it could safely do, we landed 2 human beings on the surface of another world for the first time in history. This was an epoch-making event, something people had dreamed of for thousands of years, since the first Cro-Magnon man or woman sat on a hillside in the dark and seriously wondered what that thing in the sky was. And I wish I could say we did it because of the over-arching, altruistic human need to explore the unknown. It was because of that for some of us, but that was the minor key in the symphony that got us to the Moon. The United States was galvanized into spending billions of dollars and fighting doggedly through myriad insuperable obstacles for one reason: national pride -- the real reason most countries do most of they things the do. At the height of America's Cold War with Communism, our dynamic young President dramatically set an inspiring goal that encapsulated that struggle in a perfect symbol. The excitement, the westward-ho manifest destiny woven so deeply into our national character, the clear triumph (if we made it) of American know-how over centrally controlled Soviet plodding -- it was all there. And then, to heighten that emotional charge even further, the charismatic President was cut down in the prime of his life. From then on, come heck or high water, even with a War on Poverty and a War in Vietnam on, we were going to fulfill JFK's vision and land a man on the Moon. And we did -- even when the emotions had begun to dissipate and society itself seemed to be falling apart, we still did. And when we did, it was magic. Critics talk about the "sense of wonder" you find in the books and movies that reach us most deeply. When Armstrong stepped on the Moon the world seemed to stop, a sense of wonder suffused the globe, and for one brief hour everyone with a TV set turned it on to watch. Except in the Soviet Union, although they did congratulate us in Pravda. Then, that electric charge finally dissipated, our national pride satisfied, the superiority of freedom over Communism clearly demonstrated, everybody went their way. Congress cut space funding, NASA went drifting for 40 years, and only us space junkies watched the rest of the Moon missions. As always happens with "wonder," it cannot be re-lived. 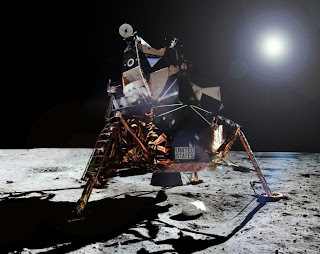 Buzz Aldrin says skipping a return to the Moon and heading directly for Mars is the best chance to experiencing the electric thrill again, and he may be right. But we don't have anyone to compete against, nothing that makes us determined to get there and willing to sacrifice. 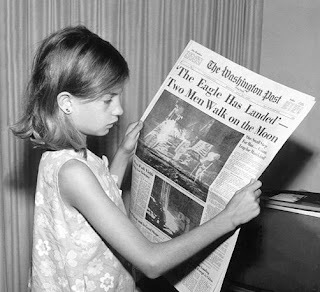 However we can commemorate the day when a unique combination of national pride, tragedy, and primal human aspirations combined to create something larger than its parts -- a world united in watching 2 of her sons walk on the Moon.